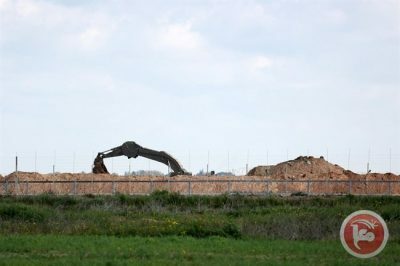 Israel began the construction of the over-ground portion of the Gaza border barrier that will connect to the under-construction sea barrier aimed at preventing the movement of the Hamas military wing out of the coastal enclave and into Israel. The Israeli Defense Ministry confirmed, on Sunday, that the over-ground section of the barrier will be 65 kilometers (40 miles) long and will be six meters (20 feet) high. The barrier is meant to prevent underground tunnels from Gaza. The barrier, estimated to cost 3 billion shekels ($833 million), will include a concrete wall fitted with sensors and reaching dozens of meters deep into the ground and standing six meters high from ground level. The barrier’s construction comes after ten months of mass protests, also known as “The Great March of Return,” launched by thousands of Palestinians civilians in protest of Israel’s blockade of Gaza. According to the Palestinian Health Ministry’s latest statistics, 263 Palestinians, including more than 45 children, were killed by Israeli forces during the protests along the Gaza border. The more than 2 million Palestinians living in the Gaza Strip have suffered from a nearly 12-year Israeli-imposed land, air, and sea blockade, which has plunged the small territory into poverty and some of the highest unemployment rates in the world. The UN has reported that Gaza could be “uninhabitable” by 2020.